This review first appeared in Turbula in September 2008. The last studio record we'll ever get from the stellar partnership between Escondido's Dave Gonzalez and the recently deceased Chris Gaffney, "Arizona Motel" would have been the band's best set yet even without the patina of loss and regret that unavoidably attached itself to the project on the heels of Gaffney's lost battle with cancer. Gaffney's distinctive singing style wasn't necessarily the prettiest you'll ever hear  and in a long solo career, he didn't always find the right setting to show off his deeply emotive vocals. But in the Hacienda Brothers, he found four like-minded musical souls in Gonzalez, bassist Hank Maninger, steel guitarist David Berzansky and drummer Dale Daniel. On the band's two previous studio releases, legendary producer Dan Penn and the band set the perfect backdrop for Gaff's gruff but tender approach. On this, their third studio recording, that same complementary setting is again present (with Penn back to produce five of the 14 tracks). 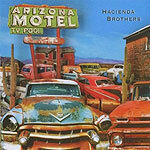 Recorded last fall, before Gaffney knew he had cancer, "Arizona Motel" continues the remarkable melding of country and R&B that made the Hacienda Brothers so unique, that led Penn to dub their style "Western soul." Penn (who back in the '60s wrote or co-wrote such classics as "Dark End of the Street" and "Do Right Woman") also contributed two new songs: "Break Free," and, co-written with Gonzalez, the dark yet lovely "Use to the Pain," a perfect song for Gaffney to wrap that rough voice of his around, with all the heartache and regret he could bring to bear. Gonzalez, who handled the lead singing duties all those years as leader of The Paladins, also tackles several songs as singer here, showing his own nice touch on his own songs "Big Town City" and "Long Way to Town." But the best, and certainly most touching moment, comes on the opening track, "A Lot of Days Are Gone." Gaffney and Gonzalez trade verses on lead vocals, and the band is at its best melding East Coast soul and Western swing.